Personal finance is the process of planning and managing personal financial activities such as incomeAnnual IncomeAnnual income is the total value of income earned during a fiscal year. 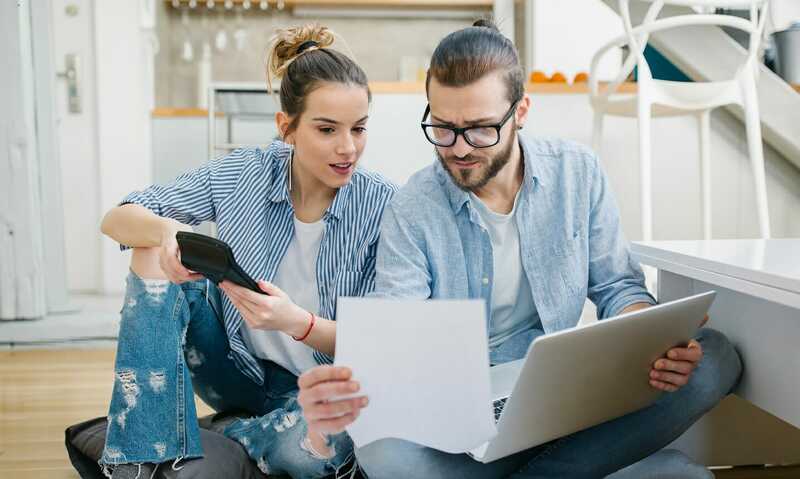 Gross annual income refers to all earnings before any deductions are made and generation, spending, saving, investingInvesting: A Beginner's GuideCFI's Investing for Beginners guide will teach you the basics of investing and how to get started. Learn about different strategies and techniques for trading, and about the different financial markets that you can invest in., and protection. The process of managing one’s personal finances can be summarized in a budgetTypes of BudgetsThere are four common types of budgeting methods that companies use: (1) incremental, (2) activity-based, (3) value proposition, and (4) zero-based. These four types of budgeting each have advantages and challenges, which will be discussed in more detail in this guide. Incremental budgeting takes last year’s actual or financial plan. This guide will analyze the most common and important aspects of individual financial management. In this guide, we are going to focus on breaking down the most important areas of personal finance and explore each of them in more detail so you have a comprehensive understanding of the topic. As shown below, the main areas of personal finance are incomeRemunerationRemuneration is any type of compensation or payment that an individual or employee receives as payment for their services or the work that they do for an organization or company. It includes whatever base salary an employee receives, along with other types of payment that accrue during the course of their work, which, spending, saving, investing, and protection. Each of these areas will be examined in more detail below. Income refers to a source of cash inflow that an individual receives and then uses to support themselves and their family. It is the starting point for our financial planning process. These sources of income all generate cash that an individual can use to either spend, save, or invest. In this sense, income can be thought of as the first step in our personal finance roadmap. Spending includes all types of expenses an individual incurs related to buying goods and services or anything that is consumable (i.e., not an investment). All spending falls into two categories: cash (paid for with cash on hand) and credit (paid for by borrowing money). The majority of most people’s income is allocated to spending. Mortgage paymentsMortgageA mortgage is a loan – provided by a mortgage lender or a bank – that enables an individual to purchase a home. While it’s possible to take out loans to cover the entire cost of a home, it’s more common to secure a loan for about 80% of the home’s value. Credit card paymentsBest Buy Credit CardA Best Buy credit card is a form of credit offered by Best Buy to its loyal customers for purchasing products and services. Learn the types, how to apply, benefits, interest rates, etc. By using their offered credit card, customers can have an easier and faster way of paying for their purchases. The expenses listed above all reduce the amount of cash an individual has available for saving and investing. If expenses are greater than income, the individual has a deficit. Managing expenses is just as important as generating income, and typically people have more control over their discretionary expenses than their income. Good spending habits are critical for good personal finance management. Saving refers to excess cash that is retained for future investing or spending. If there is a surplus between what a person earns as income and what they spend, the difference can be directed towards savings or investments. Managing savings is a critical area of personal finance. Money market securitiesMoney MarketThe money market is an organized exchange market where participants can lend and borrow short-term, high-quality debt securities with average maturities of one year or less. Most people keep at least some savings to manage their cash flow and the short-term difference between their income and expenses. Having too much savings, however, can actually be viewed as a bad thing since it earns little to no return compared to investments. Investing relates to the purchase of assets that are expected to generate a rate of return, with the hope that over time the individual will receive back more money than they originally invested. Investing carries risk, and not all assets actually end up producing a positive rate of return. This is where we see the relationship between risk and return. BondsBondsBonds are fixed-income securities that are issued by corporations and governments to raise capital. The bond issuer borrows capital from the bondholder and makes fixed payments to them at a fixed (or variable) interest rate for a specified period. Investing is the most complicated area of personal finance and is one of the areas where people get the most professional advice. There are vast differences in risk and rewards between different investments, and most people seek help with this area of their financial plan. Personal protection refers to a wide range of products that can be used to guard against an unforeseen and adverse event. This is another area of personal finance where people typically seek professional advice and which can become quite completed. There is a whole series of analysis that needs to be done to properly assess an individual’s insurance and estate planning needs. Good financial management comes down to having a solid plan and sticking to it. 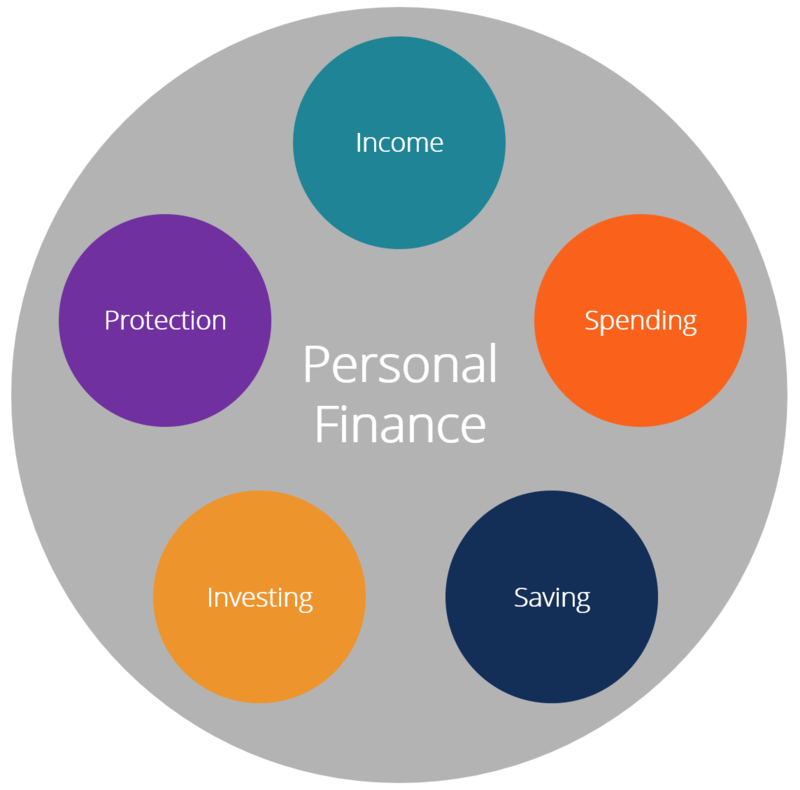 All of the above areas of personal finance can be wrapped into a budget or a formal financial plan. These plans are commonly prepared by personal bankers and investment advisors who work with their clients to understand their needs and goals and develop an appropriate course of action. Preparing a budget or a financial plan is critical for giving you the best shot at achieving your personal and family goals. 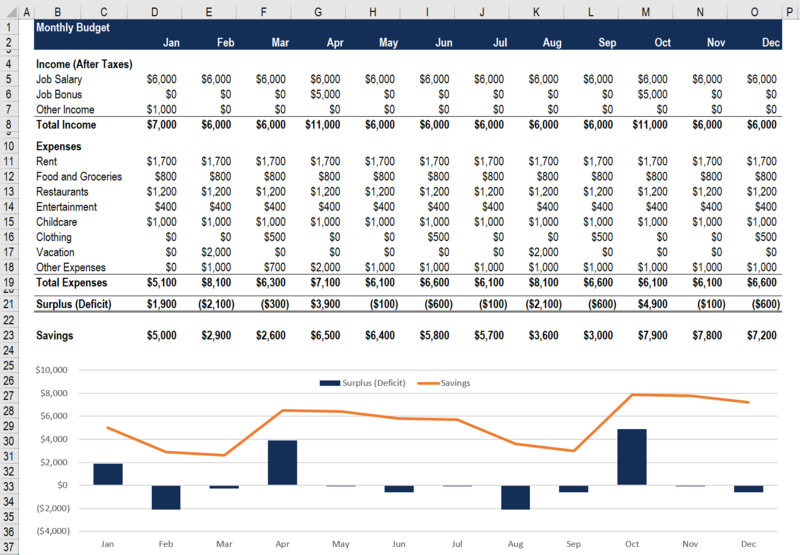 Below is an example of a simple monthly budgetMonthly Cash Flow Forecast ModelWith a rolling cash flow forecast, the number of periods in the forecast remains constant (e.g. 12 months, 18 months, etc.). The forecast is rolled forward every time there is a month of historical data to input. Rolling forecasts work best when key cash flow drivers are modeled explicitly and directly drive that could be used to manage your income, expenses, savings, and investments. As you can see in the example below, there are three potential sources of income (salary, bonus, and other), followed by a list of expenses (rent, food, groceries, restaurants, entertainment, childcare costs, vacations, etc. ), and the difference between the two is the person’s monthly surplus or deficit. If you’d like to use this free template to help you with your personal finances and planning, please download the Excel spreadsheet and edit it as appropriate to fit your own needs. Additionally, you should always consult a professional advisor before making any financial or investment decisions. There is a wide range of careers that relate to personal financial management and advice. If you’re passionate about any of the topics mentioned in this guide, you may want to consider a career in the industry. To learn more about the different careers in finance, visit CFI’s interactive Career Map to explore options on the corporate side of the industry. Some of the most common jobs on the corporate side include investment banking, private equity, and corporate development. Thank you for reading this CFI guide to personal finance. We hope it has helped you understand what managing personal finance is all about, why it’s important, and how to go about doing it.